Translation by HRIC, based on a translation by Wen Huang. We have been retained by Liu Xiaobo, the defendant in this case, and designated by the Beijing Mo Shaoping Law Firm, to act as the defense counsel on behalf of the defendant Liu Xiaobo, [who has been] charged with the crime of “inciting subversion of state power.” We will faithfully carry out the duties stipulated in Article 35 of the Criminal Procedure Law of the People’s Republic of China (hereinafter referred to as the Criminal Procedure Law) and defend the legal rights and interests of Liu Xiaobo in accordance with the law. After being retained, we met with Liu Xiaobo many times, reviewed in detail the evidentiary material that the Procuratorate sent to the Court, and have just participated in the court investigation, court hearing, and the questioning of witnesses, which have allowed us to further our understanding of the true circumstances of this case. Based on our respect for truth and evidence, and in accordance with the relevant provisions of the law, we put forward the following defense opinions, to be used as a reference by the collegiate bench during its deliberations. The defense counsel contend that the charges for the crime of inciting subversion of state power against defendant Liu Xiaobo brought by the Beijing Municipal People’s Procuratorate Branch No. 1 (hereinafter referred to as “Prosecuting Organ”) in the Branch No. 1 Beijing Criminal Indictment (2009) 247 (hereinafter referred to as “Indictment”) cannot be established. I. The existing evidence cannot prove Liu Xiaobo’s subjective intent to incite subversion of state power. According to the stipulations of Article 105 (2) of The Criminal Law of the People’s Republic of China (hereinafter referred to as the Criminal Law), intent must be the subjective requisite for a crime of inciting subversion of state power, namely, “the actor must have clear knowledge that his own act of incitement is likely to result in causing others to commit acts of subversion of state power and to overthrow the socialist system, and [must] hope for or connive at the occurrence of such consequences.” Based on the theory of criminal law, “intent” indicates a clear knowledge that one’s own actions are likely to result in harmful consequences and a hope for or connivance at the occurrence of such consequences. It consists of two key components. First is the awareness of the fact that one is committing a crime. To be specific, (i) one knows that his/her own action is harmful to society. (If an actor falsely believes that the watch on the office desk is his/hers and takes the watch, one cannot maintain that the actor had the intent to steal); (ii) one should be aware of the causal relationship between the action and the consequence; (iii) one should be aware of the object or target of the action, that is, the victim of the actor must be the object or target that the actor is already aware of (for example, killing a person under the erroneous belief that it was an animal, under unforeseen circumstances, can only constitute involuntary manslaughter). Second is the determination to act, under two types of circumstances: (i) one is aware that his/her action can result in harmful consequences, hopes that such consequences will occur, and is determined to carry out the act; (ii) one is aware that his/her action can result in harmful consequences but lets things take their course and is still determined to carry out the act. There is no evidence to prove that Liu Xiaobo was aware that the articles that he published on the Internet could produce harmful consequences to society. On the contrary, Liu Xiaobo has always believed that his actions are a rational commentary on current affairs, that he is publishing his independent views on news and events happening in our society, and that this is helping to awake civic awareness and helping the country transition to a genuinely democratic nation ruled by law; in short, that [his actions] are beneficial to social progress. For instance, of the six articles listed in the Indictment, “Can It Be that the Chinese People Deserve Only ‘Party-Led Democracy’?” and “Further Questions about Child Slavery in China’s Kilns” are commentaries against, respectively, a government white paper, entitled “Building Democratic Politics in China,” issued on October 19, 2005, by the Information Office of the State Council, and the 2007 case of black kiln slave labor in Shanxi Province. These commentaries were beneficial to society, and to the advancement of democracy and rule of law in China. Therefore, Liu Xiaobo had no “awareness of the fact” that he was committing a crime. From evidence produced by the prosecutor one can see that all of Liu Xiaobo’s articles, including the six articles and Charter 08 brought up in the charges, were published on overseas websites, such as those of Observe China, the Chinese edition of the BBC [bbc.co.uk/zhongwen], and the Independent Chinese Pen Center [chinesepen.org], etc., and that these sites can only be accessed through the use of circumvention tools. Ordinary netizens in China have no way of reading these online articles. If it is established that Liu Xiaobo had the subjective intent to “incite subversion of state power,” the prosecuting organ should provide evidence that the six articles brought up in the charges and Charter 08 were published in China. Regrettably, the prosecuting organ has failed to provide such evidence to the court. In other words, only if the netizens in China could read Liu Xiaobo’s articles could they be “incited” by his articles, only then could the objective of “inciting subversion of state power” be achieved. But they couldn’t even see the articles, so how could they be incited? There is no way for foreign netizens to carry out the act of subverting China’s state power. Furthermore, countless articles on overseas websites are many times more intense and sharp than Liu Xiaobo’s articles, but there is no way that foreign netizens will be incited by them to subvert China’s state power. The prosecuting organ charges that since 2005, the defendant Liu Xiaobo has published six inciting articles, including “The CPC’s Dictatorial Patriotism,” “Can It Be that the Chinese People Deserve Only ‘Party-Led Democracy’?,” “Changing the Regime by Changing Society,” “The Many Aspects of CPC Dictatorship,” “The Negative Effects of the Rise of Dictatorship on World Democratization,” and “Further Questions about Child Slavery in China’s Kilns,” on overseas websites, such as those of Observe China and the Chinese edition of the BBC, and engaged in rumor-mongering and slandering. It also quotes words and sentences from the said six articles and from Charter 08as the grounds to establish that Liu Xiaobo’s [actions] constitute the crime of inciting subversion of state power. The defense counsel contend that articles written by any writer should be analyzed comprehensively, in their totality, and from all aspects, such as their background, context, and the issues they address, as well as the author’s consistent personal point of view and habit of phrasing, if one is to be able to grasp the writer’s true original intentions. To put it simply, that the prosecuting organ has picked six articles plus Charter 08 from almost 800 articles totaling more than five million words (499 articles totaling more than 2.1 million words since 2005 among them) that Liu Xiaobo has written, and quoted, in the Indictment, 350 some words from these six articles and Charter 08 as the grounds to establish that Liu Xiaobo’s [actions] constituted the crime of inciting subversion of state power—is obviously too sweeping and taking things out of context. If we charge crimes according to the method of taking things out of context that was used in the Indictment, how about the following views: “China’s provinces ought to break away from the central government. The best would be to divide [China] into 27 countries and establish the ‘Republic of Anhui,’ ‘Republic of Guangdong,’ ‘Republic of Taiwan’” (see Mao Zedong’s articles “Against Unification,” written on October 10, 1920, and “The Fundamental Issue in the Problem of Hunanese Reconstruction: the Republic of Hunan,” published in Ta Kung Pao on September 3, 1920); “In short, it is the Communist Party that demands money, it is the Communist Party that demands grain. All the government decrees are Communist Party decrees, all the government blunders are Communist Party blunders. The government has lost popular trust and the Communist Party has cut itself off from the masses” (“The Party and the Anti-Japanese Democratic Government,” written by Deng Xiaoping on April 15, 1941; see Selected Works of Deng Xiaoping, Volume 1)? Should we draw the conclusion that authors of the above-quoted articles had committed “the crime of splittism,” “the crime of subverting state power,” or that they “smeared and slandered the leadership of the Communist Party”? Obviously not. By the same reasoning, can we interpret Deng Xiaoping’s celebrated dictum, “Whether a cat is black or white makes no difference. As long as it catches mice, it is a good cat,” to mean that it doesn’t matter if a cat has contracted an infectious disease, if it scratches and bites its master and destroys the furniture—as long as it can catch mice, it is a good cat, or that a yellow cat or a tabby is not a good cat even if it catches mice? Obviously not. History has proven that the 1957 “Anti-Rightist” campaign was a mistake, but if we look back on the opinions expressed in 1957 by a number of “Big Rightists” (they have all been rehabilitated now), we can see that those opinions were by no means less caustic or “reactionary” than those of Liu Xiaobo. Here are some examples: “Marxism is not suitable for China’s conditions; we should get rid of it as our guiding ideology” (remarks by Tsinghua University professor Xu Zhangben); or “If the Communist Party does not do a good job, the masses can strike at the Communist Party, kill the communists, and overthrow the Communist Party” (Ge Peiqi, a lecturer at People’s University, who was singled out by Mao Zedong himself as a “Big Rightist”); and “The problems today lie in the (one-party dictatorship) system. I declare that I will never join the Communist Party” (the words of Fei Xiaotong2). Is it possible that, rather than drawing lessons from history, we are still going to repeat the historically disastrous practices of “criminalizing speech” and “literary inquisition”? Articles with viewpoints similar to Liu Xiaobo’s are now quite common on the Internet. Many of them have even more extreme views than Liu Xiaobo’s with even sharper language. Could the writers of these articles (there are reportedly tens of thousands of them) possibly all be arrested and convicted? III. The charges in the Indictment have blurred the boundaries between citizens’ freedom of speech and criminal offense. The articles written by Liu Xiaobo ought to fall under the category of free speech. 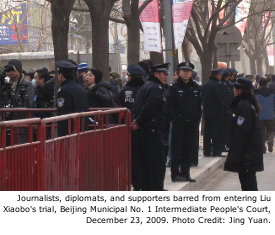 The defense counsel contend: the articles written by Liu Xiaobo merely voice certain caustic and intense criticisms, which ought to fall under the category of free speech, and free speech is a basic human right enjoyed by citizens according to the Constitution of the People’s Republic of China(hereinafter referred to as the Constitution) and the United Nations’ Universal Declaration of Human Rights. The defense counsel contend: the personal views and opinions Liu Xiaobo, as a Chinese citizen, holds regarding the ruling Communist Party of China and the related political system give no cause for reproach. Even if the critical opinions published by Liu Xiaobo directed at the Communist Party of China and state organs prove to be wrong, they still fall under the category of a citizen’s freedom of speech. He is exercising his right to free speech conferred by the Constitution, and this exercise should not be held as a crime of inciting subversion of state power. The articles written by Liu Xiaobo do not constitute a “real and imminent threat” to national security and should not be treated as a crime. As stated above, writing and publishing articles fall under the category of free speech. Although the freedom of speech cannot be violated and stripped away under normal circumstances, if it directly endangers national security, it can be banned. This is the legal basis on which the Criminal Law stipulates the crime of inciting subversion of state power. However, the criteria to determine whether a certain expression of opinion constitutes the crime of endangering national security should be strictly limited, otherwise, such determination may violate human rights. Presently, Principle 6 of the internationally-recognized Johannesburg Principles on National Security, Freedom of Expression and Access to Information, provides that: “Expression may be punished as a threat to national security only if a government can demonstrate that: 1) the expression is intended to incite imminent violence; 2) it is likely to incite such violence; and 3) there is a direct and immediate connection between the expression and the likelihood or occurrence of such violence.” This principle has been summed up as the “real and imminent threat” principle, namely, only when an expression of opinion constitutes a “real and imminent threat” to national security can it constitute a criminal offense. In the present case, there are no words or phrases in the articles written by Liu Xiaobo that incite immediate acts of violence, nor can they objectively induce such acts of violence (all articles written by Liu Xiaobo are published on overseas websites and cannot be accessed in China at all unless through the use of special methods). Quite the opposite, the gradual reform by “peaceful,” “rational,” and “non-violent” means advocated in Liu Xiaobo’s articles quite obviously does not constitute a real and imminent threat to national security and therefore should not be treated as a crime. The dictionary definition of “rumor-mongering” is “fabricating information and confusing the masses in order to achieve a certain purpose.” The dictionary definition of “slander” is “making up stories out of nothing and speaking ill of another person in order to damage his or her reputation; smearing.” The dictionary definition of “smear” is “fabricating facts to damage another person’s reputation.” (See Xiandai Hanyu Cidian [Modern Dictionary of Chinese Language], January 1983, 2nd edition, page 1443, page 315, and page 1211, respectively.) In short, “making up stories and fabricating facts out of nothing” is the common meaning of all these three terms: “rumor-mongering,” “slander,” and “smear.” In other words, “rumor-mongering,” “slander,” and “smear” all involve judgment of facts and veracity of facts, but the prosecution has no evidence to prove that the facts set forth in Liu Xiaobo’s articles are fabricated. [Statements] in the charged articles—1) “Throughout the years since they came to power, communist dictators have demonstrated that they care only about their own power; human life does not matter”; 2) “All dictatorships like to proclaim patriotism but dictatorial patriotism is just an excuse to inflict disasters on the nation and calamities on its people. The official patriotism advocated by the CPC dictatorship is an institutional fallacy of ‘substituting the party for the nation.’ The essence of this patriotism is to demand that the people love the dictatorial regime, the dictatorial party, and the dictators. It usurps patriotism in order to inflict disasters on the nation and calamities on the people”; 3) “All of the tricks used by the CPC are stop-gap measures that dictators use to cling onto the last of their power, but there is no way they can permanently prop up this dictatorial edifice that is already showing countless cracks,” and so on—are merely his personal political opinions and his views on news events. This is an issue of “value judgment” rather than a “judgment of facts.” There is no question of fabricating. Therefore, the defense counsel contend that the charges in the Indictment have confused the basic concepts of “value judgment” and “judgment of facts,” and that the charges cannot be established. In Charter 08, the statement, “of all the great nations of the world today, China alone still clings to an authoritarian way of life and has, as a result, created an unbroken chain of human rights disasters and social crises, held back the development of the Chinese people, and hindered the progress of human civilization,” is a conclusive summary of Chinese history since 1949. “Human rights disasters and social crises” refer to the Anti-Rightist Campaign, the Great Leap Forward, the Cultural Revolution, June Fourth, and the repression of the non-state-sanctioned religious activities and the rights defense movement (see Liu Xiaobo’s statement in court). These are objective facts. They are not rumors subjectively fabricated by Liu Xiaobo, and there is no question of slander here. What should be noted here is that the values and ideas in Charter 08 are consistent with the ideas in the Universal Declaration of Human Rights and the International Covenant on Civil and Political Rights. For example, the statements related to freedom, human rights, and equality in Charter 08 can be found in the provisions of Article 1, Article 2, and Article 3 of the Universal Declaration of Human Rights, as well as in the provisions of Article 6, Article 9, Article 12, Article 14, Article 16, Article 17, Article 18, Article 19, Article 22, Article 25, and Article 26 of the International Covenant on Civil and Political Rights. (It should be emphasized that the Universal Declaration of Human Rights is one of the most important United Nations official documents and that the People’s Republic of China as a permanent member of the United Nations Security Council cannot but endorse the ideas in the Universal Declaration of Human Rights. The Chinese government signed the International Covenant on Civil and Political Rights more than a decade ago.) Not only do the ideas espoused by Charter 08 not violate the Constitution, rather, they are in accordance with many of the Constitution’s provisions. For example, [the concept of] judicial independence can be found in Article 126 of the Constitution; human rights guarantees in Article 33 (3); election of public officials in Article 3 (2); freedom of association, of assembly, and of speech in Article 35; freedom of religion in Article 36; property protection in Article 13; social guarantees in Articles 43, 44, and 45; environmental protection in Article 26, etc. The viewpoints charged in the Indictment—“abolish the privilege of one-party monopoly on power” and “establish the Federal Republic of China under the framework of a democratic and constitutional government”—were not at all initiated by Liu Xiaobo. They are consistent with the political positions of the Communist Party of China and its principal leaders, such as Mao Zedong and Liu Shaoqi. In his article, “New- Democratic Constitutional Government,” Mao Zedong pointed out, “Just as everyone should share what food there is, so there should be no monopoly of power by a single party, group or class.”3 In a March 30, 1946, Xinhua Daily editorial, as well as in his article “One-Party Monopoly Leads to Widespread Disasters,” Liu Shaoqi said, “One-party rule is anti-democratic; the Communist Party decidedly does not engage in one-party dictatorship” (Liu Shaoqi, Liu Shaoqi xuanji, Shanghai Renmin Chubanshe, 1981, Volume 1, pages 172–176). The Declaration of the Second National Congress of the Communist Party of China clearly calls for “using a free federal system to unify China proper, Mongolia, Tibet, and Muslim Xinjiang and establishing the Federal Republic of China.” Is it possible that when the Communist Party of China and its principal leaders oppose one-party dictatorship and call for the establishment of a federal republic, they are great, glorious, and correct, but when Liu Xiaobo and others advocate such positions they are doomed to the misfortune of imprisonment? Based on the principles of “no crime can be committed, and no punishment can be imposed, without an existing penal law” and “proof beyond a reasonable doubt,” one should not hold that Liu Xiaobo’s [actions] constitute the crime of inciting subversion of state power. To this very day, neither China’s legislature nor the Supreme People’s Procuratorate or the Supreme People’s Court (hereinafter referred to as the “Two Supremes”) have come up with a clear definition of “inciting subversion of state power through rumor-mongering, slander and other means,” nor do they have the authority to explain it. For this reason, to this day there are no convincing criteria for making a rigorous and scientific distinction between this crime and the citizens’ freedom of speech . For example, what kind of opinions expressed under what type of circumstances constitutes criminal offense? Because of this, the determination of this crime in current judicial practice is strongly subjective, random, and vague, making it impossible for Chinese citizens, when they publish their opinions, to have any “reasonable expectations” as to whether their expressed opinions constitute a criminal offense or not. This, in essence, runs contrary to the spirit of the rule of law. Therefore, the defense counsel contend that before the National People’s Congress and its Standing Committee, as well as the Two Supremes, make legislative or judicial explanations, based on the principle of “no crime can be committed, and no punishment can be imposed, without an existing penal law,” Liu Xiaobo should not be held guilty and punished. Based on common sense, only Liu Xiaobo’s own explanations about the articles he has written can come the closest to his original intent. Other people’s explanations can only be used for reference; in the “interrogation transcripts” of the investigative organ as well as in his confession in court, Liu Xiaobo has remarked that the six articles written by him and Charter 08 express his own viewpoints and positions on current affairs, without any intention to incite subversion of state power. Even if the public prosecutor has interpreted the six articles and Charter 08 differently, namely, if he has interpreted them as constituting “the crime of inciting subversion of state power,” the court should not, based on common sense and the principle of “proof beyond a reasonable doubt,” hold that Liu Xiaobo’s actions constitute criminal offense. IV. There were significant flaws in the investigation, procuracy review and indictment, and trial processes. Based on the provisions of the Criminal Procedure Law and the Provisions on Procedures for Handling Criminal Cases by the Public Security Organs,4 the investigative organ should abide by the following rules when adopting residential surveillance measures: 1) Residential surveillance should be conducted at a criminal suspect’s domicile (only if a suspect has no fixed domicile can the investigative organ designate a residence to carry out residential surveillance. Liu Xiaobo has legal domicile in Beijing, yet the residential surveillance was not conducted at his own residence according to law); 2) The person placed under residential surveillance has the right to live with his or her cohabiting family members (during the time Liu Xiaobo was under residential surveillance, he was only allowed to see his wife twice; his wife had absolutely no knowledge of where Liu Xiaobo was held); 3) A suspect placed under residential surveillance needs no approval to meet with his or her lawyers (lawyers retained by Liu Xiaobo’s wife made repeated requests to the Beijing Municipal Public Security Bureau to meet with Liu Xiaobo, but never received any reply). The investigative organ in this case, the Beijing Municipal Public Security Bureau, did not comply with the above rules at all. The residential surveillance of Liu Xiaobo carried out by the Beijing Municipal Public Security Bureau was in fact detention in disguise. Based on provisions in the “Reply of the Supreme People’s Court on the Question of Whether the Period of Residential Surveillance Can be Counted Toward the Prison Sentence” (released on December 18, 1984), if the court finds Liu Xiaobo guilty, the time spent during “residential surveillance” should be deducted from the sentence. According to the provisions in Article 139 of the Criminal Procedure Law, the People’s Procuratorate shall interrogate the criminal suspect when reviewing a case, and hear the opinions of the victims as well as the counsel retained by the criminal suspect and the victims. According to the provisions in Article 12 of the People’s Procuratorate Provisions on Guaranteeing Legal Practice for Lawyers in Criminal Procedures, when the People’s Procuratorate reviews a case transferred to it for prosecution, it should hear the opinions of lawyers retained by the criminal suspect and the victims, record them clearly in transcripts, and add them to the case file. If it is difficult to directly hear the opinions of the lawyers retained by the suspected criminal and the victims, the prosecuting organ may send a written notice to them, asking them to give written opinions. [In this case] the prosecuting organ never heard the opinions of the defense counsel in accordance with the law. During a one-day period between December 8 and December 9 of 2009, the defense counsel did not even have enough time to read all of the case files, and had no means of putting forward a defense counsel’s opinion. The prosecuting organ has violated the law and the related judicial explanations in the said procedure. The court failed to deliver notice of the trial to the defense counsel within the period designated by the law. Around 2:30 p.m. on December 20, 2009 (Sunday), the defense counsel for this case received a phone call from the judge assigned to this case, saying that the trial would take place in Courtroom No. 23 at 9:00 a.m. on December 23, 2009 (Wednesday). Based on Article 151, Section 1(4) of the Criminal Procedure Law, after a People’s Court has decided to open a trial, it should deliver written notice of the trial to the defense counsel no later than three days before the opening of the trial. The “three days” should be understood as an interval of three days, as three full days. The day when the trial opens and the day of the notice should be excluded from the count. Obviously, the time between 2:30 p.m. on Sunday, December 20 and 9:00 a.m. on Wednesday, December 23 does not amount to three full days. There is no basis in law or jurisprudence for the presiding judge’s refusal to cross-examine evidence submitted by the defense counsel before the trial. During the trial session, the counsel presented to the court documents related to how the Communist Party of China and its leaders consistently opposed the one-party dictatorship and advocated the establishment of a federal republic to prove that charges against Liu Xiaobo in the Indictment cannot be established. However, the presiding judge denied cross-examination on the grounds that the prosecutor did not have time to prepare for the cross-examination. The defense counsel contend that: 1) If the prosecutor needs to make necessary preparations for the cross-examination of evidence presented by the defense counsel to the court (before the trial, the defense counsel already communicated a brief explanation of the said evidence to the prosecutor), according to the provisions of Article 155 of The Explanations of the Supreme People’s Court on Some Issues Concerning the Implementation of the Criminal Procedure Law of the People’s Republic of China, the court should adjourn and, according to the specific circumstances, allocate enough time for the prosecution to prepare; it cannot deny cross examination. The above-mentioned action by the presiding judge had no legal basis; 2) In terms of jurisprudence, the principle for collecting evidence in a criminal proceeding is “to exclude all reasonable doubt.” As long as the evidence submitted by the defense constitutes a “reasonable doubt,” regardless of when it is presented to the court, it should be cross-examined; it cannot be rejected. There is no basis in law or jurisprudence for the presiding judge to set limits on the speaking time for the defendant and his counsel. The defense counsel contend that: 1) There is no legal basis for the presiding judge to set in advance a limit on the speaking time for the defendant and his defense counsel; 2) In terms of jurisprudence, the above-mentioned action by the presiding judge constitutes a violation of the defendant’s and his defense counsel’s right of defense; 3) Compared to the defendant, the prosecuting organ is clearly the more powerful party. Allocating the same amount of speaking time given the powerful party to the defendant and his defense counsel is seemingly fair, but it is in essence unfair. There is no legal basis for the presiding judge to repeatedly interrupt the defendant’s final statement. Based on the provisions of Article 160 of the Criminal Procedure Law, after the presiding judge declares the conclusion of the court debate, the defendant shall have the right to make a final statement. When the trial of this case entered the final statement stage, the presiding judge repeatedly interrupted Liu Xiaobo’s final statement. For example, when Liu Xiaobo said that the path of his thinking had reached a turning point in June 1989, the presiding judge interrupted him by saying: That involves the June Fourth Incident; there is no need to talk about it. In fact, Liu Xiaobo had merely mentioned it as a time reference. His statement did not touch upon the June Fourth Incident. On the other hand, even if Liu Xiaobo’s statement really “involved” the June Fourth Incident, there was no reason for the sudden interruption. Our country is in the process of steadily improving the rule of law. During this process, it is perfectly normal for there to be a difference in opinion on some issues, and particularly so when it comes to dealing with certain questions of guilt and innocence. But the defense counsel firmly insist that a verdict that contributes to the respect for and guarantee of basic human rights, including the freedom of speech, will be a fair and just verdict, a verdict that will withstand the test of history! We earnestly request that the Beijing Municipal No. 1 Intermediate People’s Court give sufficient consideration to the opinions of the defense counsel and render a not-guilty verdict to Liu Xiaobo on the basis of the facts and in accordance with the law.